For the fourth consecutive year, the film program in the College of Visual and Performing Arts was ranked by the Hollywood Reporter on its list of the “Top 25 American Film Schools.” The list ranks Syracuse at No. 23. Syracuse students take part in a combined Film Production and Italian Studies program in Bologna, Italy. 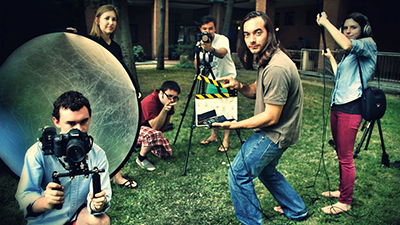 Based in the college’s Department of Transmedia, the bachelor of fine arts and master of fine arts film programs offer inclusive, interconnected opportunities that focus on the international independent filmmaking world. In addition to a highly diverse student body, students may take a semester at the famous FAMU (Film and TV School of Academy of Performing Arts) in Prague, Czech Republic, working in 35mm production; a summer program in Bologna, Italy, that includes participation in one of the world’s major classic film festivals, Cinema Ritrovato; and a semester in Los Angeles, where students take courses with some of Hollywood’s great professionals and intern for Hollywood production companies. Syracuse University is also a member of the International Filmmaking Academy, to which it sends two students every summer to study with the likes of Bernardo Bertolucci, Danis Tanovic, Claudia Llosa, Rob Nilsson and others. Film students also participate in the Sundance Film Festival each year and serve as interns at the Cannes and Tribeca festivals. In addition, the Syracuse International Film Festival brings dozens of visiting artists from the U.S. and world cinema into the classroom.